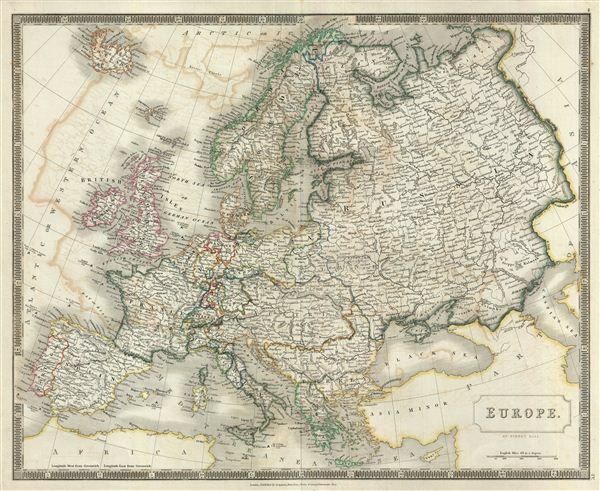 This is a beautiful map of Europe from Sidney Hall's extremely scarce 1835 New General Atlas. It covers the entire continent from the Atlantic Ocean to the Ural Mountains and from the Arctic Ocean to northern Africa and Turkey, including Iceland. It includes Spain, Portugal, France, Italy, European Russia, Sweden, Denmark, Norway, Germany, Ireland, Great Britain, Turkey in Europe and Greece. Towns, rivers, mountains, steppes, islands, and various other important topographical details are noted. Elevation throughout is rendered by hachure and political and territorial boundaries are outlined in color. Several battle grounds are marked throughout, including the Battle of Groix under Admiral Lord Bridport in 1795, and various sites for the Battle of Trafalgar in 1805, among others. It shows the Austrian Empire at its height, the many states of the German Confederacy, and a pre-Garibaldi Italy split into numerous small duchies and states. During this time, The British Empire rose to its peak while the Ottoman Empire was declining. Poland is notable absent, having been absorbed and divided by neighboring Russia, Austria, and Prussia. Issued following the defeat of Napoleonic France and the Congress of Vienna, Europe is shown under a new peaceful balance of power, centered on the five most important powers (also referred to as the five 'Great Powers'): the United Kingdom, France, Russia, Prussia and the Austrian Empire. Alas, the 'peace' was but an illusion as the treaties ending the Napoleonic Era were inherently flawed. Old rivalries festered and nationalism, liberalism, revolution (industrial and otherwise) was once again on the rise throughout Europe. Philips (Atlases) 758. Ristow, W., American Maps and Mapmakers: Commercial Cartography in the Nineteenth Century, p. 303-09.